Archbishop Joseph E. Kurtz of Louisville, Ky.
Pictures and numbers that show the disastrous effect of Typhoon Haiyan numb the mind. More than 4 million people have been displaced — about the population of Kentucky. More than 1.1 million homes have been damaged, more than half of them totally destroyed. The death toll is more than 6,200 — the population of a small town. Numbers like that overwhelm everyone. That’s why on the eve of the Super Bowl, I’m packing sneakers to join a delegation with Catholic Relief Services to meet with Filipino church leaders and people from Samar and Leyte, the two Philippine islands in the eye of the storm. I’ll visit Palo, just south of the city of Tacloban, and I’ll walk through rubble to let people know that the Catholic Church in the United States cares and will help. I and others are visiting personally so that we can wrap our hearts and minds around the situation. This firsthand look will enable us to adequately convey to fellow Catholics the spiritual, physical and emotional extent of the damage. The Filipino diaspora in the United States, more than 4 million people, make up the second largest Asian-American community in our nation. They agonize for their homeland. This trip reflects solidarity of the church in the United States with Filipinos on both sides of the Pacific. Catholicism’s liturgies and devotions are integral to the Filipino community. The Philippines are 80 percent Catholic, the third largest Catholic country in the world, after Brazil and Mexico. Filipinos now seek to rebuild their infrastructure of schools, churches, hospitals and seminaries. For these needs, the only source of help is other churches, who understand that faith sustains people. Cardinal Luis Antonio Tagle of Manila will meet us to provide details. He holds a master’s and doctorate in sacred theology from The Catholic University of America. Having lived in the United States, he has full confidence and high hopes for the generosity of his sisters and brothers from the USA. The trip highlights the person-to-person solidarity that we feel for suffering people. We are thankful that people survived the Typhoon Haiyan’s assault, but now the survivors need clean water and other aids to maintain basic hygiene. They need soap, buckets, detergent and water purifying kits to prevent spread of disease. Survivors live amidst debris that blocks streets and roads. They need help to clear avenues so aid can get through. They need hammers and saws and tarps to keep out the rain from their emergency A-frame houses. The creation of permanent housing stands ahead of them. This challenges the entire Catholic Church. On Nov. 10, two days after the typhoon struck, Pope Francis told the world “the victims are many and the damage enormous.” He asked that we “try to get our concrete aid” to the typhoon survivors. He initially donated $150,000 for relief efforts. On Christmas, he spoke of the Philippines again. American Catholics responded quickly, too. CRS, the U.S. church’s international aid agency that is backed by the generosity of U.S. Catholics, has collected tens of millions of dollars so far for Philippines disaster relief. To date, CRS has provided 200,000 people with emergency shelter, clean water and sanitation, and debris clearing. The agency has installed water taps and water bladders to provide tens of thousands of people with clean drinking water. It has begun construction of model homes that can be easily adopted by local communities in Palo. It’s all part of our commitment to our Filipino brothers and sisters as they rebound. Of all who can help, Americans stand first in line. We understand solidarity. We’re can-do people who walk with people in need. That is part of the message I hope to deliver on Super Bowl Sunday when I land in the Philippines. As people at home participate in our sports tradition and root for the Seattle Seahawks or the Denver Broncos, I’ll check the score from an ocean away and immerse myself in another U.S. tradition: showing support for people in desperate need. 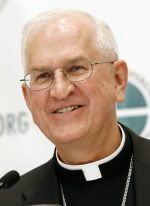 Archbishop Joseph E. Kurtz is president of the U.S. Conference of Catholic Bishops. PREVIOUS: Human trafficking a shameful reality in Pa.